Head over to Hanoi, Vietnam, one of the rising stars of Southeast Asia for an unforgettable vacation with today's Groupon to An Hung Hotel. 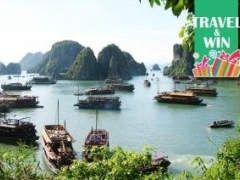 For $306, you get a 4D3N An Hung Hotel Stay with 2 Way Vietnam Airlines Flight and Tour for One Pax (worth $615). For $1195, you get the above for Four Pax (worth $2460). Located within the historic Hanoi old quarter as opposed to its distant cousin, the young, modern setting of An Hung Hotel plays host to double dwellers and stray offspring, with daily morning sustenance included to ensure calming of inner and outer beasts. 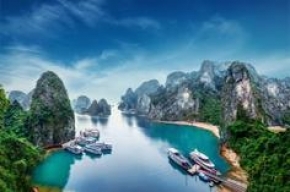 Set sail along Halong Bay, a UNESCO World Heritage Site, over a span of a day, or opt for the overnight cruise where guests may mingle and tingle with loved ones and potential loved ones. Step off the beaten track and get a dose of Vietnam, old-school style with a tour to Ha Long City. Soak in the rustic atmosphere of this laid back district as you slurp on local fare. Then, cruise along at a leisurely pace and take in the natural wonders that are Thieng Cung cave or Sungsot cave. On the next half of your trip, pay tribute to Hanoi’s history. Enjoy the architectural and historical aspects of Ho Chi Minh Mausoleum and Museum, and experience firsthand the rich culture that defines Hanoi. Whether it’s the majestic structure of the One Pillar Pagoda or a fascinating display at the Ethnology Museum, camera-wielding and Wikipedia-quoting tourists are guaranteed satisfaction on their trip. Finally, get down to the ultimate must-do on every getaway; a round or two or bargain hunting in Hanoi’s sprawling street markets. Reviews Extremely good location, very good value for money. Either for business or leisure trips, this is a great place to stay in Hanoi. Staff can be very helpful, rooms are very nice and so is breakfast!" I stayed at the A&EM Hotel in Hanoi with my girlfriend for only one night before flight back the beginning of December and thoroughly enjoyed my stay. I did a lot of research online and knew this hotel would be beautiful, but was concerned about the location. The hotel is beautiful and the staff is great. At check in, I asked if they could upgrade us to a nicer room and the front desk staff was able to get us an upgraded junior suite with a beautiful view of the Old quarter with a balcony. It's located in the old quarter streets, easy to get around to everything. We had a fabulous time staying at this hotel and I would highly recommend it to anyone going to Hanoi."